A few days after Nita posted that photo, I noticed her name had popped up on one of my favorite podcasts ever: No Guitar Is Safe, hosted by Jude Gold. Naturally, I listened to it right away! I wanted to hear more about her and her music. Her conversation with Jude Gold, with whom she’s been friends for almost 10 years, was a great way of learning her background and approach to music. When she was about 15 years old, she discovered AC/DC and Led Zeppelin. Of course, with guitar players like the Young brothers and Jimmy Page, it’s hard not to be drawn to guitar! But it sounded to me like it wasn’t until she started discovering artists like Eric Johnson and Joe Satriani that she started taking guitar more seriously as a tool to address one’s emotions. She specifically cites Johnson’s “Cliffs of Dover” as a moment when she realized the guitar was capable of making you feel so many different things – in this case, happiness with lots of energy! Then, her father Don Menn, who is the former editor of Guitar Player magazine and a respected publisher in the industry, introduced her to guitarists like Steve Vai, Jeff Beck, and Steve Morse. After that guitars and music were always going to be a big part of her life! I thought the entire interview was enlightening. Gretchen walks you through how she started her musical career. She also discusses her new album, and our topic for this review, Abandon All Hope. I was intrigued and wanted to listen to the entire record. But even before listening to a note from the album, I liked her attitude and approach to creative processes a lot! Throughout the interview, there were several things to which I related so strongly that I was compelled to check out the album sooner rather than later. I first listened to it on Apple Music, where I subscribe for streaming, and then ordered the CD from her site so I could listen to it with the booklet providing the additional layers of this literary journey. One thing I thought was really cool was an e-mail I received from Gretchen. I mean, it showed up as “Gretchen Menn Store” as that’s from where I ordered the CD; but the tone in the e-mail made it pretty clear it was her. She thanked me for purchasing the album, told me she was going to sign it, and asked me if I wanted my booklet personalized along with the signature. I never miss a chance to customize something – so I decided I indeed wanted mine personalized. I remembered something she and Jude were talking about in the podcast and thought that would be perfect! At one point, as they were talking about keeping an open mind when it comes to music, she said “I love too many types of music to be a purist in any”. And I loved it! That’s how I feel about the music I like. I have favorites: heavy metal and hard rock. However, favorites don’t mean that you should close your mind to everything else. And I know Gretchen isn’t the first musician to express their open-mindedness, but in our climate of over-categorization where we pigeonhole musicians into one category and never allow them to exit, it’s important that they speak up and reject labels. Your favorites should never prevent you from exploring, and if you are a musician, you shouldn’t be afraid of exploring whatever your heart desires. So, I e-mailed her back, told her about all of this, and asked if she could write something about it when she signed. And now, let’s talk about Abandon All Hope. 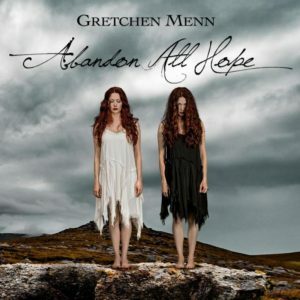 Abandon All Hope was released in December 2016 and it is Gretchen Menn’s 2nd solo album (first one was called Hale Souls). It’s a concept album that’s based on Dante’s Inferno – if you actually buy the CD, you get the libretto written by Mike Molenda and the artwork by Max Crace. I’ve never read Dante’s Inferno (I know, I know… I really should!) so it was great to have the libretto and the artwork as those helped me navigate through the story. Just added a lot to the overall vibe. Molenda also came up with the concept idea and brought it to Gretchen who then took it away and wrote the music. In some ways, it reminds me of Bruce Dickinson’s “The Chemical Wedding”, in that, it also is based on literary works of a big artist (William Blake) and the album takes you on a journey based on his work. It’s an instrumental album where Gretchen focused less on guitar riffs and more on songwriting. There’s a story to tell; so the music needed to reflect the accurate mood based on where you were in the story. This ended up making the album influenced a lot more by classical music than it is by heavy metal or hard rock. Thus, if you are looking for a “shred” album featuring crazy guitar solos throughout, this isn’t the album for you. There is a lot of guitar – but only to complement the string arrangements and whatever else the songs required for the right vibe. One reason why songwriting was the focus was because not every piece of music Gretchen had in mind fit the traditional aspects of Western music writing: tension and release. In the interview with Gold, she says sometimes she needed tension, followed by more tension! Songwriting is a completely different skill than guitar playing – not every technically capable guitarist can be a great songwriter. Menn took up that challenge and, in my opinion, nailed it. It’s hard to write for one instrument to begin with, but to actually write an entire album with guitars, bass, drums and a string quartet? I’m not sure how many guitar players would even attempt that. When I first listened to the album, I liked it right away. I’ve always tried to keep an open mind when it comes to genres – but I’ve also always liked certain classical composers like Mozart and Rossini, so the album’s overall tone was appealing to me. But to be honest, this album is a dense album with lots going on. Plus, it’s a concept album so, there’s a lot to get into. My experience was that I needed a few listens to fully digest what was in there and truly appreciate it. If you’ve listened to it once and feel like you’re not really gelling with it, give it another spin – with the booklet in hand! It’s hard to name a favorite because the songs flow so well together but I’ll give you a few highlights to get you started. “Shadows”, the album’s opener, starts us off with a really cool guitar lick accompanied with string arrangements and a great foundation of drums and bass. I think it’s a good way of giving the listener a sample of what they’re about to hear on the entire album. I especially love the melody that starts around 2:02 – it’s super catchy too. “Hound of Hades” starts with a guitar-driven rocking riff. It’s a relatively more straightforward song, at least in the beginning. There’s a super cool lead around the 1:30 mark, and I think this song is where the bass and drums shine the most. It’s definitely one of my favorites. I think “Limbo” and “Tempest” together are great representations of what this album is all about and they work great when listened to consecutively. “Limbo” has a dark vibe; it features some heavy string arrangement – makes you feel sadness and fear. It kind of reminded me of some of Mozart’s work. Afterwards, you kick into “Tempest” where we hear more of Gretchen’s guitar playing. I love “Tempest” because it reminds me of some of Brian May’s solo albums. It has that kind of nice, easygoing melody that takes you to a happier place than the first couple of songs on the album. One more amazing highlight I have to mention is “Beast” – it’s such a great track! It’s more guitar oriented than most other songs and the way keyboards work in this song reminds me a bit of early Deep Purple which is never a bad thing! If you are a fan of ’70s rock with a progressive edge, you will likely listen to this one repeatedly – like I did! And last but certainly not the least, “Grace” is an amazing closer. The song is mainly comprised of classical guitar and string arrangements. In typical Abandon All Hope fashion, it goes through tempo (and overall vibe) changes – starts with a heavy Mediterranean sound with classical guitars and string arrangements, but then switches to a more classical vibe and I even hear very jazzy arrangements at some point. Electric guitar makes a comeback towards the end, everything blends incredibly well together and we conclude our journey here. I’ve personally enjoyed Abandon All Hope thoroughly. It’s so different than anything else I’ve heard – and I mean it in the best way possible. Sometimes it’s nice to take a break from whatever your favorite genre is and appreciate a unique album that also tells you a story – especially one that tells it without any singing! If you want a lot of guitars and a rock sound, this won’t be the album for you. But if you would like to hear how traditional rock instruments can blend in with a string quartet and generate a completely different world for you to enter, I’d highly recommend it. After all, we don’t want to be “purists”; we just want to enjoy good music.